If you’ve been searching for the perfect luxury apartment home in North Aurora, IL, your search is over. Welcome home to Springs at Orchard Road. We go out of our way to provide you with high-end, in-home features and community amenities to enrich your daily life. Picture yourself waking up on a quiet morning in your spacious master bedroom. Make yourself a pot of fresh aromatic roast coffee in your upgraded kitchen, then enjoy it on your private balcony or patio. If you prefer to start your morning with a workout, take advantage of our 24-hour fitness center, complete with advanced cardio machines and free weights. When you’re ready to head to work, you can pick up your car from your convenient on-site garage options and enjoy a short commute to work via Interstate 88. No matter your mood, Springs at Orchard Road has the quality features and finishes that always deliver. 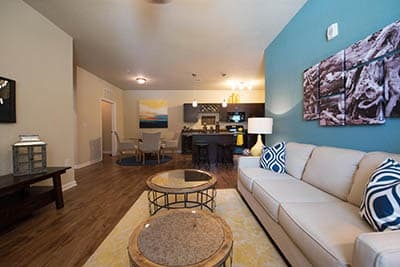 If you are ready to tour our luxury apartments for rent in North Aurora, IL call our professional management team today to schedule your personalized VIP tour.